Founded in 2017, the Water Resources Club is open to undergraduate and graduate students- from any major- who are interested in water-related sciences. 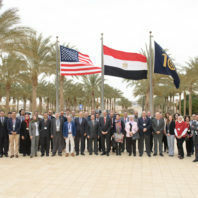 The overarching mission of the Club is to 1) educate students and the public about local, regional, and global water issues, 2) provide opportunities to improve water resources, 3) help facilitate hands-on, research experiences for students and 4) socialize in a relaxed and inclusive environment. We don’t have any meetings set for Spring semester but if you are interested in the Water Resources Club please contact Julie Padowski at julie.padowski@wsu.edu. Please check back often for new events and opportunities! The USGS is seeking summer interns to evaluate hydrologic cycle models and observational data across the United States. A prototype tool has been developed that allows exploration of observations and model results at several spatial and temporal scales. During the summer, a team of students will engage in rigorous application of this tool to identify the strengths and weaknesses of existing models of the hydrologic cycle. Students will also have the opportunity to improve the tool and add functionality. Through frequent interactions with developers of hydrologic models within USGS, interns will be challenged to think critically about the representation of hydrologic processes used in models and to consider alternative strategies towards model development and evaluation. Students will be encouraged to think of their work as culminating in a presentation or scientific publication highlighting the strengths and weaknesses of hydrologic process representation. This unique summer session will be held at the USGS offices in the Denver Federal Center. Applications through USAJobs are due April 10. Please contact either of the project leads, William Farmer (wfarmer@usgs.gov, 303-236-4981) or Jessica Driscoll (jdriscoll@usgs.gov, 303-236-4979), with any questions. 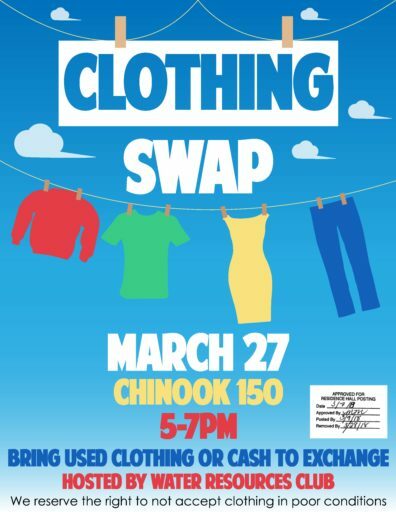 Join us for our first-ever clothing swap! Come bring your clothing to exchange for other clothing! Don’t have any clothing you’d like to exchange? That’s ok! You can buy clothing for very low prices, as well. The goal of this event is to reuse clothing, and reduce the water use in clothing production, and to bring awareness to this. Want to know more about much water goes into clothing production, and what you can do about it? More Ways to Follow the WRC! The State of Washington Water Research Center (WRC) is pleased to be partnering with the Pacific Northwest National Laboratory (PNNL) to offer undergraduate internship opportunities to WSU undergraduates who are interested in water resources. Internship Program is now closed for the 2018 Fall Term, please come back again for the 2019 Fall Term. This new internship experience operates within the existing Science Undergraduate Laboratory Internships (SULI) Program, but aims to facilitate water-related learning opportunities specifically between WSU undergraduates and PNNL researchers. Hands-on experience as research interns. Students will spend 10 weeks (summer term) or 16 weeks (semester term) at a PNNL facility working on a water-related research project under the guidance of a laboratory scientist or engineer. A variety of learning opportunities, including enrichment activities, career professional development workshops (e.g. technical and scientific writing skills development, poster, or oral presentation activities, etc. ), laboratory tours, scientific lectures and seminars. A stipend of $500 per week during the internship period and reimbursement for one round trip domestic travel to the host laboratory (if permanent address is more than 50 miles from the host laboratory). Housing information prior to arrival at the host laboratory. In general, housing opportunities will vary from laboratory to laboratory. An allowance is available for participants placed at host laboratories that are unable to offer direct housing arrangements. Ensuring selected students are placed in one of the four PNNL locations (Seattle, WA; Sequim, WA; Richland, WA or Portland, OR). Each facility offers different research opportunities and students are paired to locations that best match their water research interests. For questions about the State of Washington Water Research Center/PNNL SULI Water Internship Program, please email swwrc@wsu.edu. Application requirements for the WRC/PNNL SULI Water Internship Program are the same as those for the SULI program. Students are required to 1) complete the online application form and 2) submit two letters of recommendation. Apply here! Select Pacific Northwest National Laboratory- Richland, WA as the 1st choice. Note this will not limit you to the Richland, WA facility. Include in their Research Interests essay that you are applying to SULI through the WRC/PNNL SULI Water Internship Program. Email the WRC once you have submitted (swwrc@wsu.edu) so that we can place your name in the WRC/PNNL SULI internship sub-pool of applications. This step is critical to helping us match you with a PNNL researcher.